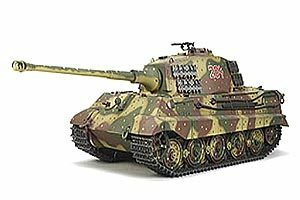 Tamiya is proud to release the 1/16 scale R/C assembly kit of the Russian heavy tank KV-1 which terrified German forces during WWII. 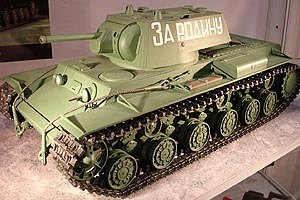 The dynamic form of the KV-1s angular, welded turret has been accurately reproduced, and accessories such as the tow cables and tool boxes highlight its superb exterior details. Many metal parts have also been incorporated with the chassis to ensure high durability. 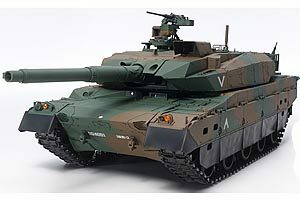 In addition to forward/reverse running and left/right turning, the tank also features realistic barrel and hull recoil actions when firing the main gun. The front machine gun also features muzzle flash effect and firing sounds, while both the headlight and taillight are controllable as well. Rear-mounted pre-assembled gearbox features twin motors for plenty of power. 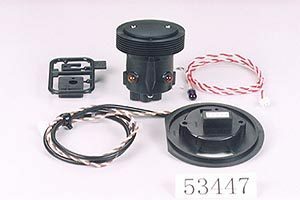 Metal parts such as the lower hull, suspension arms, and drive sprockets ensure durability. 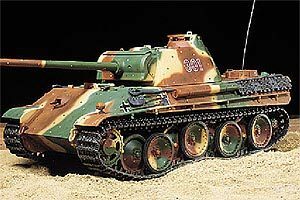 The suspension is just like that on an actual KV-1 and features metal torsion bars and pre-assembled resin tracks to absorb terrain undulations. In addition, the DMD Control Unit T-08 features a special low-speed setting which enables slow lumbering movements for even greater realism. During main gun firing, the barrel-mounted LED flashes, firing sound roars from the onboard speaker, and the turret recoil unit and drivetrain gearbox work in conjunction to produce realistic barrel and hull recoil movement. 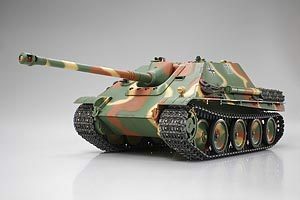 Tamiya 1/16 RC Jagdpanther Full Option Kit LTD This is for kit only, however, if you require this model as Built or RTR, please email to discuss further options. 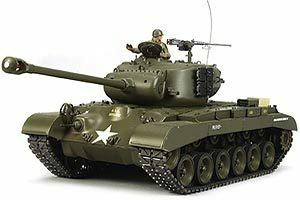 Tamiya 1/16 RC Sherman DMD w Option Kit This is for kit only, however, if you require this model as Built or RTR, please email to discuss further options. 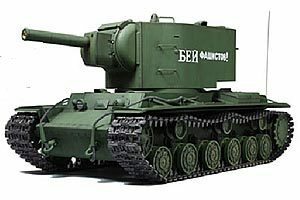 Tamiya 1/16 RC Russian KV-II full option This is for kit only, however, if you require this model as Built or RTR, please email to discuss further options. 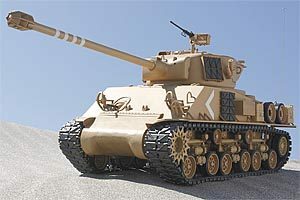 Tamiya 1/16 RC M26 Pershing w Option Kit This is for kit only, however, if you require this model as Built or RTR, please email to discuss further options. 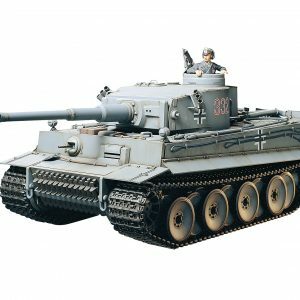 Tamiya 1/16 RC King Tiger w Option Kit This is for kit only, however, if you require this model as Built or RTR, please email to discuss further options. 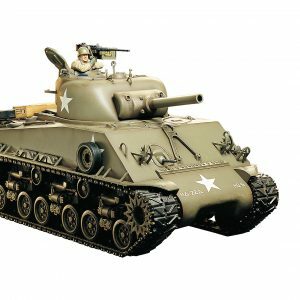 Tamiya 1/16 RC M51 Super Sherman full option This is for kit only, however, if you require this model as Built or RTR, please email to discuss further options. 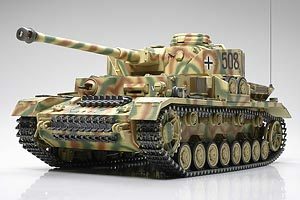 Tamiya 1/16 RC Panzer IV J w/Option Kit This is for kit only, however, if you require this model as Built or RTR, please email to discuss further options. Tamiya 1/16 RC Tiger I Early w/Option Kit This is for kit only, however, if you require this model as Built or RTR, please email to discuss further options. 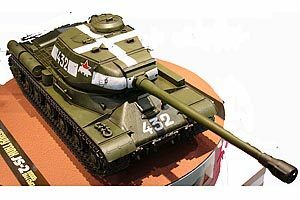 Tamiya 1/16 RC Russian JS-2 1944 with Option Kit This is for kit only, however, if you require this model as Built or RTR, please email to discuss further options.